Puzzled. That’s how I feel a few minutes after parking the Jaguar XE in the middle of Königstrasse, Stuttgart’s main pedestrian area. I’ve got out of the car, taken a few steps back and am waiting for the crowds to flock around it. Because it’s the Easter holidays, the street is full of folk, both young and old. 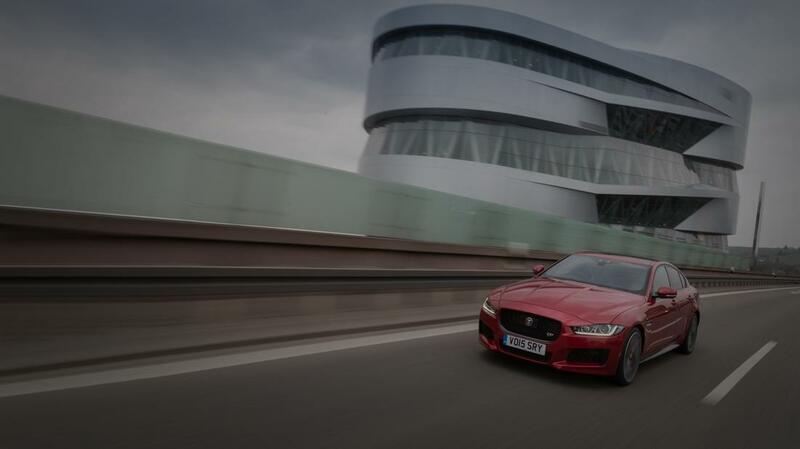 What’s more, this is Germany, home of the executive saloon, and the XE is the segment’s newest entrant. Surely people will come flocking and allow me to ask them what they think of it, thus filling this story with tales of how the people of Germany reacted to a new British model pitched right in their car-making heartland. But something’s wrong. No one is coming to have a proper look. Everyone is walking past, some slowing to stare inquisitively from a distance, others going out of their way to avoid the car and the photographic equipment around it. The puzzled looks on their faces match the one on my own, prompted by the German public’s unwillingness to engage in my wholly unscientific social experiment. Of those people I can hear 10 paces away, my pidgin German suggests they’re commenting on the numberplate. “Great Britain” and “England” are the words I can make out – not “new Jaguar” or “those folk down the road at Mercedes-Benz have something to worry about” (or whatever the German is for that). Finally, after about 10 minutes, a few people stop to take more than a cursory glance. One teenager gets out his camera phone and shoots the car from every angle. An older gentleman takes a keen interest in the XE’s front end, so I open the bonnet for him to have a look. That’s when – at last – the rest of Stuttgart comes to take a peek. As I open the four doors, bonnet and boot of the car to the Stuttgart townsfolk, inviting them to have a proper nose around, the older gentleman is joined by many more inquisitive people. Before we know it, some of them have jumped into the car, while others queue politely, awaiting their turn. Everyone from teenagers to young couples, and groups of young adult friends to trendy-looking people wearing impeccably tied scarves are getting in and wanting to tell me what they think of the new XE. “This is my dream car,” says one chap in his early 20s. “Can I have it?” asks another. However, there are still a few we can’t win over. An elegant older lady smiles but says she “doesn’t like the colour” of our Italian Racing Red XE. Apparently, her favourite colours are black and grey. My heart sinks a little. A party of schoolchildren is amazed by the British numberplate and the fact that the boot flips open by itself at the touch of a button on the key fob, but their interest ends there. Photographer Achim tells me younger Germans are apathetic towards cars, a trend that’s being repeated across the world. 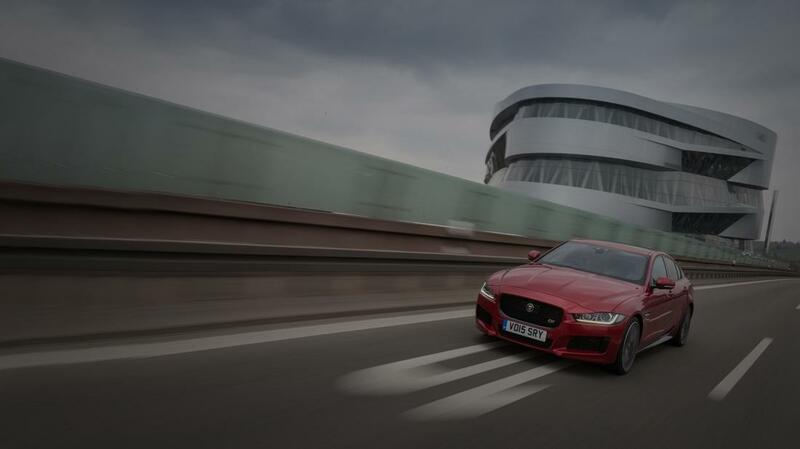 So what brought us and the Jaguar XE to Stuttgart anyway? 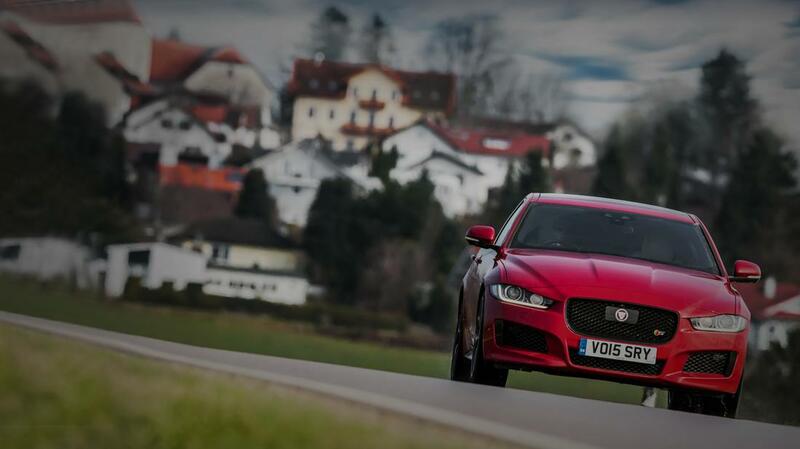 First, the opportunity to take the new XE to the public and see what they would make of it. It just so happened that this public were German – surely a hard bunch to win over, given their country’s strong presence in the class in which the XE competes. Second, since we’d been given the keys to a late pre-production model, it would have been a shame just to take it to a solitary street in Stuttgart. Instead, a proper road trip was required to assess the XE’s development. Third, once we’d settled on Germany as a destination, the hard points of the route became obvious and, possibly, a little cheeky. We’d go from the home of Mercedes in Stuttgart to BMW’s home in Munich, with a detour to the north of Munich and Audi’s home town of Ingolstadt along the way. We collect the car in Stuttgart, a hilly working city in the south-west of Germany. I arrive early on a Thursday morning on flight 918. The number tickles me more than it should but for the fact that Stuttgart is also the home of Porsche and the 918 Spyder. Who says the Germans don’t have a sense of humour? I meet the XE for the first time parked outside an airport hotel. It’s hard to miss: it’s a grey day, there are grey buildings and parked around them are cars in about 49 or so different shades of grey. The only splashes of colour come from the red of the enormous Bosch logo on the sides of one of the airport buildings – and the XE. I’ve seen the model countless times at recent motor shows and heard many a Jaguar executive talk about it, but now I’m on my own as I get in this XE and take it on the road for the first time. The first thing I do, as I imagine a lot of business drivers of this car will too, is connect my phone to the new InControl infotainment system. It’s a simple, fuss-free process, but even better is the fact that this is finally a new system, meaning the archaic and outdated infotainment system that preceded it is no more. The first entry I punch into the sat-nav is the aforementioned Königstrasse, which we visit via a sneaky picture opportunity at one of Daimler’s city headquarters. The security guards there take it all in good spirits. Also en route is the hilly Eugensplatz, with its two tram lines running down the middle and a school at the top where we turn around for runs up and down the hill for the benefit of the photographer. Here, unlike with the younger audience we meet later at Königstrasse, the XE causes a stop-the-traffic moment as the teenagers take pictures of it on their camera phones. Some get a better view by standing on the zebra crossing, blocking the road and adding more traffic to the school run. I’m sure the locals are delighted. At Königstrasse, the crowds eventually arrive to pore over the XE. Two policemen in their E-Class estate drive to within 20 metres of us but don’t get out to ask why we’ve driven a car into their pedestrian area. Instead, they have a good look for a couple of minutes before driving off again, leaving us undisturbed. The last stop in the middle of Stuttgart is the impressive Mercedes-Benz museum, a futuristic-looking building built of metal and glass. It’s something you hope that Jaguar, with such a strong heritage of its own, will one day emulate. I’m sure the group of visitors would include the elderly Swedish gentlemen I encounter who’ve just visited the museum. 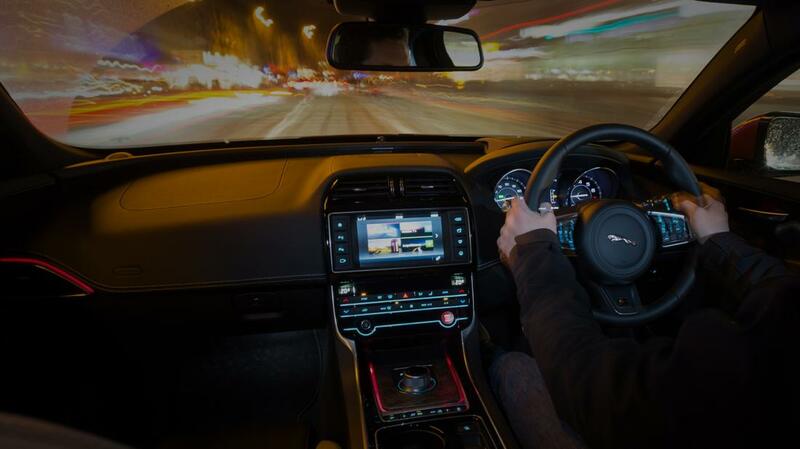 Each turns out to be a Jaguar owner and they jump at the chance to sit in the new XE. As I head out of town, something catches my eye that doesn’t fit with the grey, industrial dourness. It’s an open-air events area that’s home to the Cannstatter Wasen festival – essentially a spring version of Oktoberfest. We park next to what appears to be a House of Horrors – an enormous structure that has some genuinely terrifying details and which is awe-inspiring in its sheer size and the thoroughness of its intricate design. I fail to get a reaction to the XE from the 20ft-high, evil-looking giant standing outside the House of Horrors, nor from his shorter mate and the two chaps hanging from the sides. However, the Hall of Fame, a legal graffiti wall that’s built into the Cannstatter Wasen, offers the chance for the Virgin Mary to say a prayer for the XE’s success. Our last stop in this area is Solitude Castle. It sounds like an ITV game show but in fact was once the home of a duke fond of contemplation. Dog walkers and families now frequent the place. One labrador walker tells me the car is “nice”, although perhaps he’ll be waiting for the anticipated canine-friendly estate version. The autobahn that runs between Stuttgart and Munich is the A8, a road that doesn’t fit the usual autobahn stereotype. 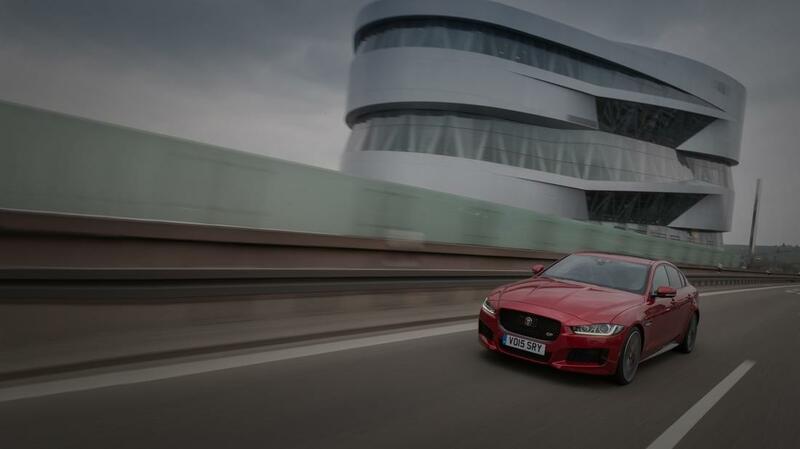 The section we travel on is a 150-mile frustration of road works and lowered speed limits that offers precious few opportunities to really stretch the 335bhp supercharged V6 in our S-spec XE test car. We hit the road at rush hour, but at dusk the impeccable driving manners of the German autobahn users are momentarily forgotten as they hover in the outside lane to get a better look at this bright red thing on British registration plates. Day turns to night, grey weather gives way to rain. 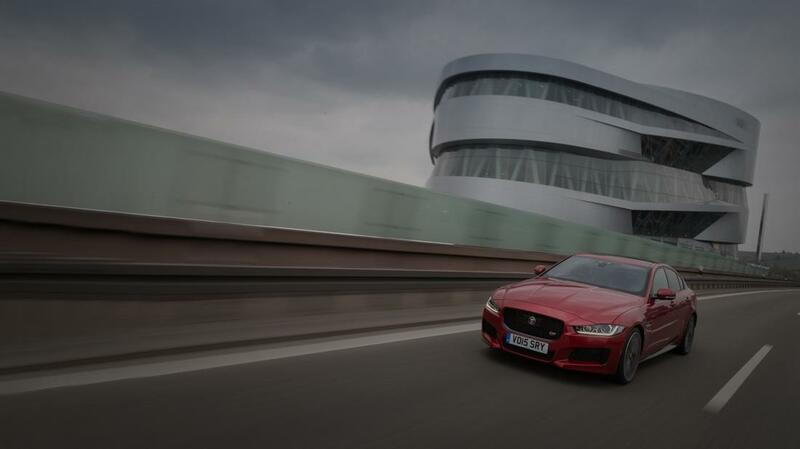 We leave the A8 before Munich to divert north to Ingolstadt, with the sole mission of snapping the XE outside the vast Audi Forum, which includes a museum. It’s cold, dark and wet as we pull up outside the Audi Forum, but at least its lights are on. Of course, I’ve come inadequately dressed for the conditions, so I remain in the comfort of the car as Achim takes his pictures. I get a fright as two chaps appear at the passenger’s window wanting to peer in, although not as big a fright as any motorists driving through the neighbouring traffic lights as Achim’s flash gun goes off. They probably think they’ve been caught by a speed camera. The two men – probably Audi workers, given their closeness to the Audi building and distance from any other kind of civilisation – know all about the XE and remark that it is “even more beautiful than the Mercedes C-Class”. However, they don’t offer an opinion on how it compares with the new Audi A4, which is due to be revealed in a matter of months. Next, it’s time for a short midnight run into Munich on an unrestricted autobahn free of roadworks. This stretch provides my abiding memory of driving the XE. I live out a scenario that owners may experience in the future. It’s late at night and it has been a long day on the road. You’re happy, though, because your XE has room for your coffee, storage for your Twix and a home for your phone while you charge it up and play your music through the car’s quality stereo. Visibility is good, the cabin comfortable and the buttons easy to locate and use, while the ‘correctness’ of the control weights makes driving the XE intuitive. There’s also enough performance beneath your right foot to be a pacesetter on the autobahn (or motorway). It’s a recipe that should please most customers in this market segment, and one that is welcome by the time we hit Munich in the small hours. By this time, its streets are largely empty. On the edge of the city, the magnificent Allianz Arena football stadium, home to Bayern Munich, remains illuminated, as does the similarly impressive BMW Welt, the home of the BMW museum. Both offer more photo opportunities. We see not a single soul at the Allianz Arena, and the few vehicles that pass us outside BMW Welt are trucks. In one, I spy a pair of construction workers discussing the XE in such great detail that they miss a whole traffic light sequence. Our 15-hour day behind the wheel ends with a photo shoot near Munich’s scenic sites, which include Leopoldstrasse, Siegestor, Ludwigstrasse and Odeonsplatz. Along our route, photographer Achim’s camera flash surprises a few more unsuspecting motorists. The following morning the grey clouds remain, so the chance of more photography south of Munich towards the Alps holds more appeal than mixing it in Munich’s sodden Friday morning rush hour. By the time we reach a collection of pretty villages, among them a place called Starnberger See, and the wide, winding roads that link them, the sun miraculously decides to appear, meaning a visit to a car wash is in order to prettify the XE for the remaining pictures. I can’t decide if the one we end up in is incredibly old-fashioned or bafflingly futuristic. It is attached to the end of a shop and looks like a cross between a garage and a climatic chamber. It costs €17, so I trust the XE will emerge box-fresh. Fortunately, it does, and now hairpin-filled roads in the forest take us to our penultimate stop: the delightful town of Murnau am Staffelsee, which has cobbled streets and is overlooked by the magnificent Alps. The spring sunshine gives way to a hailstorm. We decide to head back towards the airport, but not before a final stop at a motorway service area,where half a dozen Polish truck drivers are the latest to do the now familiar ‘point, stare, camera phone’ routine. Flying home (sadly not on flight 918, 911 or any equivalent famous German car name), I’m left to ponder whether we ticked off our three-strong checklist. Points two and three were taken care of, what with a mighty road trip and some friendly door-stepping of the German big three. 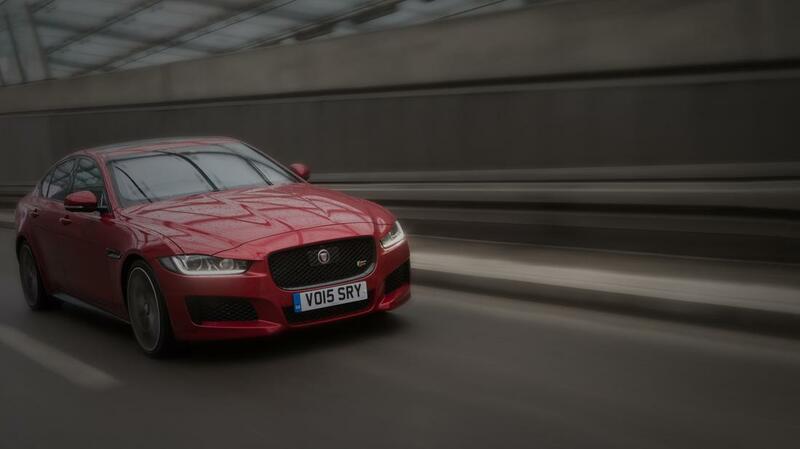 As for the big one, just how did people react to the XE? The car was definitely a head-turner, although I’m sure some of that was down to its bright colour, British plates and the fact that the steering wheel was on the ‘wrong’ side. Whatever – the truth is that Germany noticed the car. People felt compelled to stop and take a look, discuss it, point it out to their friends and companions and even take a picture of it. You can bet they’d have told others about what they saw that day, too. That’s something I just can’t see happening with your average German executive saloon, no matter how new it may be.